After 15 years of strategic partnership, China and the Association of Southeastern Asian Nations (ASEAN) will soon unveil a blueprint for upgraded cooperation, synergizing their development plans in the coming decade and beyond. The blueprint, known as the China-ASEAN Strategic Partnership Vision 2030, is expected to be released at the 21st China-ASEAN (10+1) leaders' meeting in Singapore in mid-November. Chinese Premier Li Keqiang will attend the meeting as well as the 21st ASEAN-China, Japan and Republic of Korea (10+3) leaders' meeting and the 13th East Asia Summit – all parallel events of the 33rd ASEAN Summit, following an official visit to Singapore that starts on Monday. Briefing reporters about Premier Li's forthcoming tour to Singapore, Chinese Assistant Foreign Minister Chen Xiaodong said Thursday that Beijing looks forward to the release of the vision, which will outline the future of China-ASEAN ties and cooperation. China is willing to promote close alignment between the Belt and Road Initiative (BRI) and ASEAN's development plans, aiming to achieve mutually beneficial results, Chen stressed, adding that Li will propose over 30 new initiatives on regional cooperation. Proposed by Chinese President Xi Jinping in 2013, the BRI comprises the Silk Road Economic Belt and the 21st Century Maritime Silk Road, and aims to build trade and infrastructure networks connecting Asia with Europe and Africa along and beyond the ancient Silk Road routes. Chinese companies are already actively involved in infrastructure construction in Southeast Asia. For example, China and Laos are working together to build a 414-km-long high-speed rail linking the two countries; Chinese telecommunications giant Huawei has helped Brunei build its first 3G and 4G mobile networks, providing services to more than 400,000 locals; In Cambodia, China Datang Corporation has invested and built a hydropower plant and a 230-kV power transmission project. "The proposed China-ASEAN Strategic Partnership Vision 2030 will lead to better coordination between the Belt and Road Initiative and ASEAN's development plans," Chinese Foreign Minister Wang Yi said on the sidelines of the country's annual legislative session in March. China is looking to upgrade its strategic partnership and build a closer community of shared future with ASEAN, according to Wang. In a speech at a seminar to commemorate the 15th anniversary of the China-ASEAN strategic partnership in April, Chinese Ambassador to ASEAN Huang Xilian suggested that the new vision can be a "bridge" connecting the Chinese dream of national rejuvenation and the ASEAN Community Vision 2025. "We shall enhance synergies between the Belt and Road Initiative and the Master Plan on ASEAN Connectivity 2025," he added. Since China and ASEAN forged their strategic partnership in 2003, the two sides have been engaged in increasingly closer cooperation in various fields while seeking solutions to their differences through talks. Two-way trade between China and ASEAN jumped from 55 billion US dollars in 2003 to 514 billion US dollars in 2017, nearly a ten-fold increase in a span of 15 years. China has been ASEAN's largest trading partner for nine consecutive years and ASEAN has been China's third largest trading partner for seven straight years. Two-way direct investment had totaled nearly 200 billion US dollars in aggregate terms by the end of last year. "The establishment of the China-ASEAN Free Trade Area in 2010 has been a major boost to our trade relations," Huang noted. Moreover, mutual visits between the two sides in 2017 reached 49 million, and the exchange of international students had exceeded 200,000, according to the ambassador. On the other hand, China and ASEAN countries are making concerted efforts to maintain peace and stability in the South China Sea and formulate regional rules despite some overlapping territorial and maritime claims among them. In November 2002, China and ASEAN countries signed the Declaration on the Conduct of Parties in the South China Sea (DOC). Last year, they approved the framework of the Code of Conduct (COC) in the South China Sea. Earlier this year, China and the regional bloc arrived at a single negotiating text for the COC, which will serve as the basis of future COC negotiations. Chinese and ASEAN naval forces took part in a joint maritime exercise off the coast of southern China's Guangdong Province in late October, for which a joint command post was set up. "It manifests the enhanced mutual trust between our naval forces," said Peng Guliang, a Chinese naval commander participating in the drill. 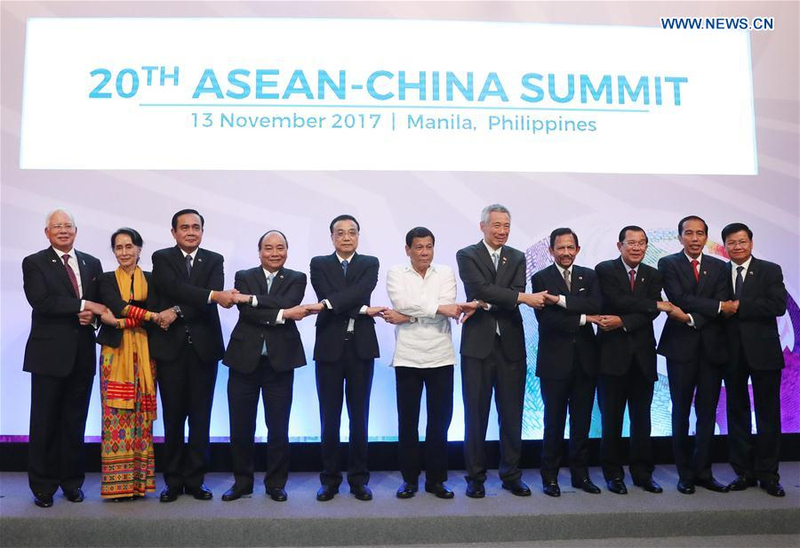 Working on the basis of improved ties, China and ASEAN are ready to upgrade their cooperation framework from "2+7" to "3+X" – a significant change in the Vision 2030 put forward by Premier Li during last year's China-ASEAN (10+1) leaders' meeting in the Philippine capital Manila. The 3+X, using the letter X in math to represent the unknown, means China-ASEAN will touch many fields while focusing on three pillars – political security, economy and trade, and people-to-people exchange. "If our partnership over the past 15 years is version 1.0, we expect version 2.0 of the next 15 years to be more substantive, forward-looking, carrying more significance both regionally and internationally," Ambassador Huang said in his speech in April.